Ray Carns | Thoughts on photography, writing, film making, and other items of interest. My image, Illuminated Reception, was chosen for inclusion in the Long Shot 2014 fund raiser, June 22, 2014, at the Photographic Center NW. 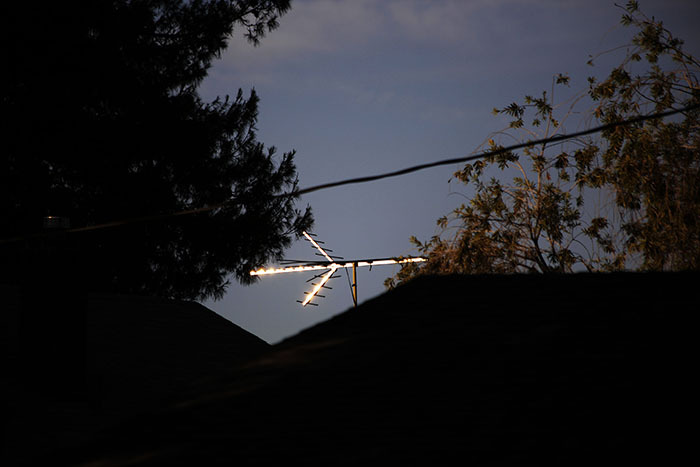 This image was shot on June 20, 2014 from my backyard, late in the day, near sunset. This entry was posted in Exhibits on June 28, 2014 by Ray. Afternoon Light in the Stairwell was also chosen for the Cell Phone III online exhibition at the Texas Photographic Society, juried by Nate Larson, Artist & Professor of Photography at the Maryland Institute College of Art (MICA). 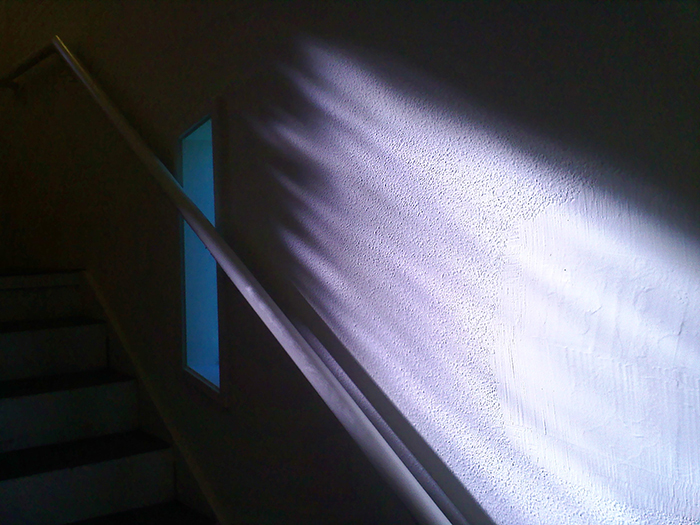 My photograph, Afternoon Light in the Stairwell, was chosen for Mobile Magic IX at LightBox Photographic Gallery. This entry was posted in Exhibits, Prints on June 28, 2014 by Ray. Whenever I’m in Palm Springs, I make a habit of going to the Palm Springs Art Museum. 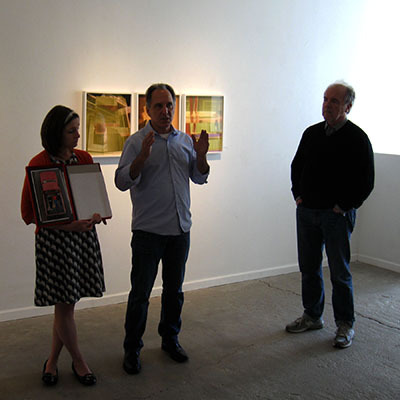 In recent visits I’ve seen work by Hank Willis Thomas and Roger Ballen in the exhibits the museum has presented. 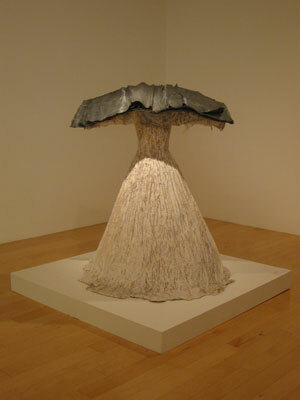 Additionally, I like revisiting some of the work they have in their permanent collection. 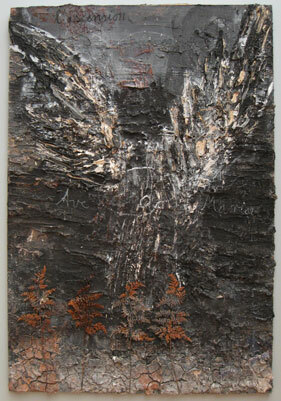 Some of my favorites from their permanent collection are The Starn Twins and Anselm Kiefer. 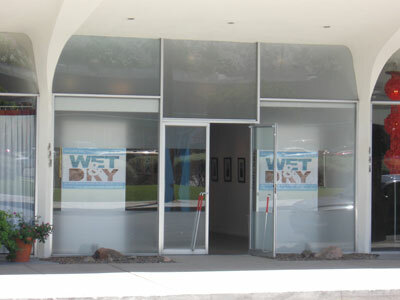 Other Works Not to be missed is their glass art collection, which is located in the gallery just west of the gift shop. There is some truly beautiful work in there. 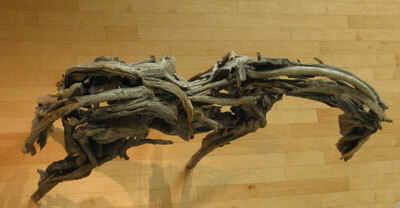 The Palm Springs Art Museum is a true gem in the desert. If you are passing though the area, be sure to include this museum on your list of must sees. This entry was posted in Uncategorized on June 25, 2014 by Ray. After leaving Kopeikin Gallery and lunch at Canter’s Deli with students from ASU, we moved on to Paris Photo L.A. for our VIP Tour. Guided by our “muse”, Noelle, we visited several gallery spaces with pieces she thought would be of interest to us. After the tour, we broke into small groups and explored on our own. 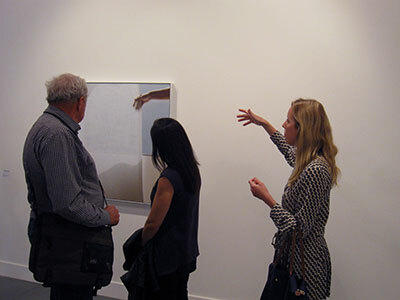 some of the galleries we visited with Noelle were: Ambach & Rice, where we saw work by Abigail Reynolds; 1301PE, showing work by Uta Barth; Flowers, with work by Mona Kuhn; Kate Werble, exhibiting John Lehr; and work by Nicolai Howalt at Martin Asbaek. Abigail Reynolds. I’ve seen A New Light on various sites on the web and not been particularly impressed. 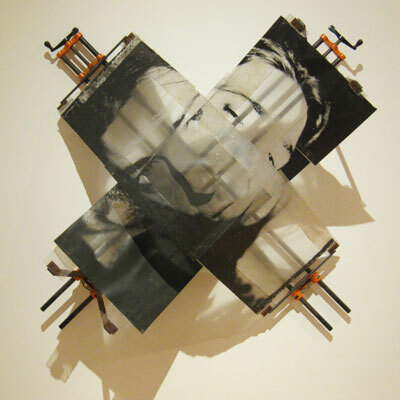 However, also exhibited were her collage works where she made different types of cuts and folds to expose a different view underneath, which were very interesting. Uta Barth. 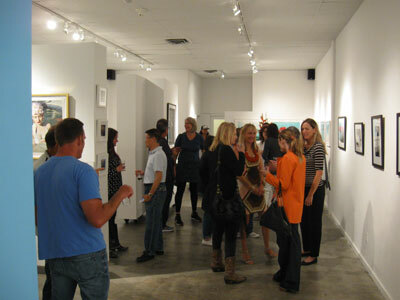 Exhibited were some of her photographs from the Deep Blue Day series. These photographs have a certain lightness to them, like the gauze-like curtains obscuring or held back to expose the blue sky outside. Seemingly simple somewhat monochromatic photographs that make the viewer want to see what’s beyond the curtain, even when the curtain is pulled back to show only sky. Even so, there is something soothing about these photographs. Mona Kuhn. 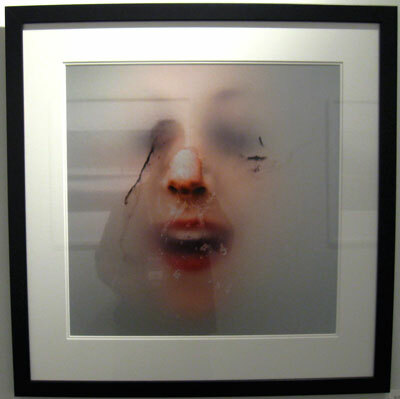 Her latest work deals primarily with reflections and shadows. Nudes photographed through windows with the reflections from the outside visible, obscuring and enhancing the figure on the other side of the glass, or nudes photographed partly in shade, where the darkness of the shadow obscures part of the figure. 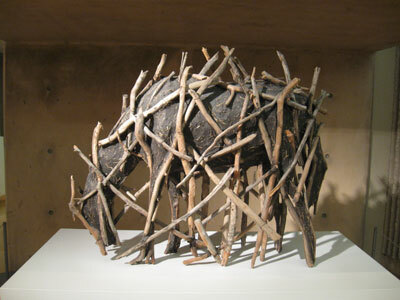 This is something I’ve seen in the past in her work, and although it’s not a technique I especially care for, I do find it interesting. 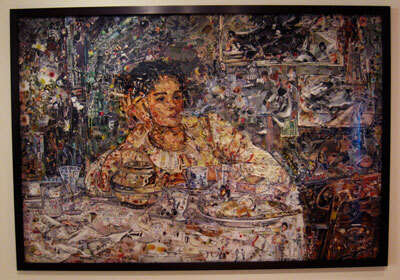 One of my favorite works by Mona is Marina, 2009 from her Native series. John Lehr. These are abstract photographs of subjects, such as paint drips on glass at a body shop, graphically interesting images, but somewhat lacking in substance. No that that’s a bad thing, but I really wanted more. 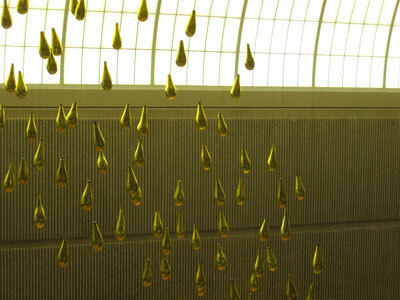 Other work by him I’ve seen on line, I do like, especially Window Drawing. Nicolai Howalt. 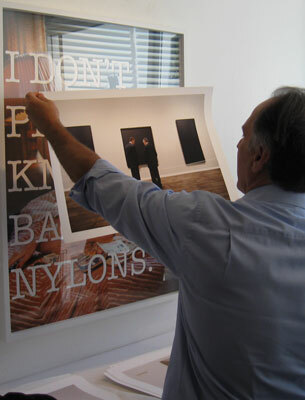 The images exhibited were from his Car Crash series. I was not impressed by this. I made images similar to this in the 70s. 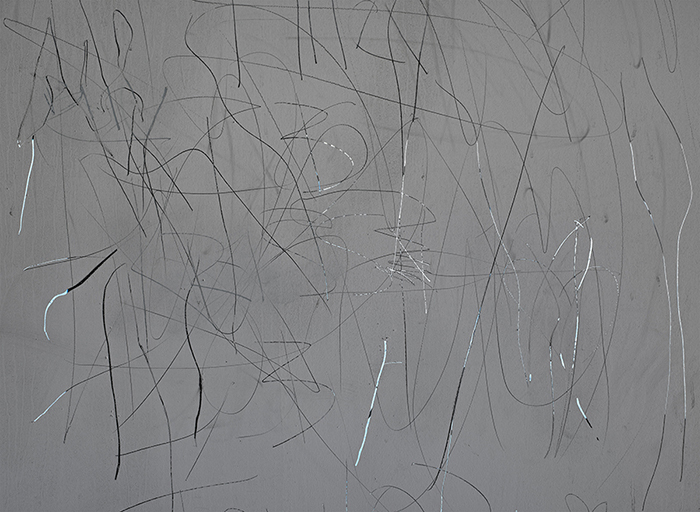 Mine were b&w, 8×10, gelatin silver prints, but similar subject matter–abstract images of car damage. He did go a step further and photographed air bags, which we didn’t have in the 70s, but those I found boring. This begged for me to see something different, and I didn’t. One of the exhibits we viewed was Unedited! 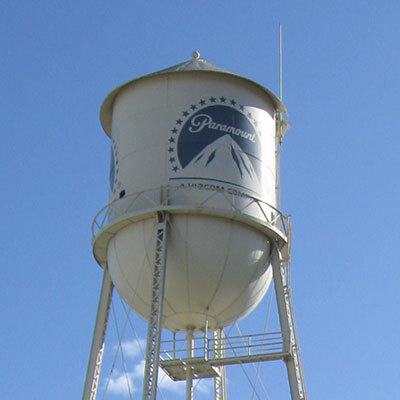 LAPD Photo Archives. These were photographs of crime scenes and mug shots from the 20s through the 70s. I had heard about this exhibit and so did many other people, judging from the line to get in, but once inside, I was not moved. The presentation with the photos framed in simple black frames spaced equally around the walls seemed to absorb the impact of the subject matter. I should have felt something from the photographs of gun shot victims and bullet holes in windshields and bodies on the ground, but I left feeling nothing, when I should have felt something. Am I that jaundiced to photos of this nature? I may be in the minority, but the presentation did the subject matter a disservice, such as Victim’s Feet Hanging Off Bed, 1934. And, of course, as Arizonans, not Arizonians, we had to stop by the Etherton Gallery space, which was exhibiting work by Danny Lyons. 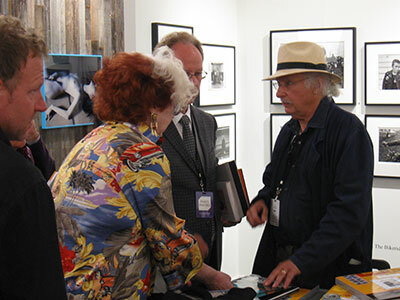 Danny Lyons at the Etherton Gallery booth at Paris Photo L.A. While there I picked up a copy of Danny Lyon’s, The Seventh Dog. I heard this first edition was a press run of 3,000 and a second version for an upcoming exhibition was in progress. When he signed it, he asked, Are you a photographer? I said, Yes. End of conversation. 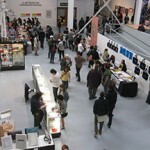 Hopefully, the conversation between Danny and Catherine Opie, who was in line behind me, went better. I was told he doesn’t like his photo taken. Yeah, like I follow directions. 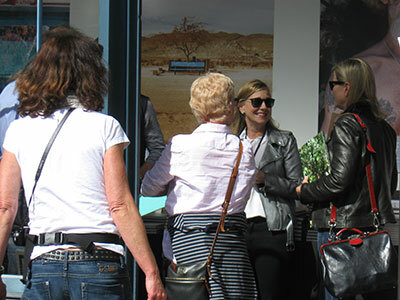 From there, I went off to see Nancy Baron who was signing her book, The Good Life: Palm Springs at Kehrer Verlag. The US edition is due in the fall. 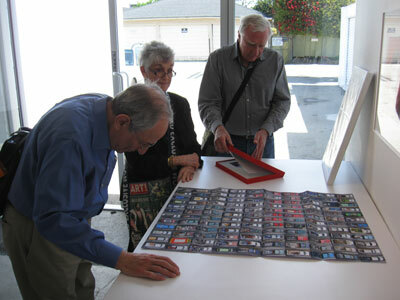 Nancy Baron at her book signing for The Good Life: Palm Springs, at Kehrer Verlag. Nancy Baron signing her Book, The Good Life: Palm Springs. The highlight of my whirlwind tour was seeing work from the Bullet series by Lalla Essaydi at Jenkins Johnson. I’ve seen her work before online, but not as a physical print. The prints were large and beautiful, and thoughtful at the same time, dealing with gender stereotypes in, and as viewed in, the Moroccan world. I absolutely love Lalla’s work. 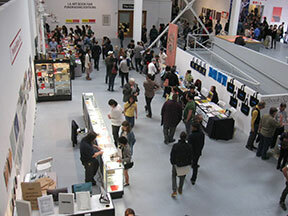 Unfortunately it was only a half day at Paris Photo L.A., so everything was rushed, and I’m sure there were a lot of things I missed. Following are some shots from that day. 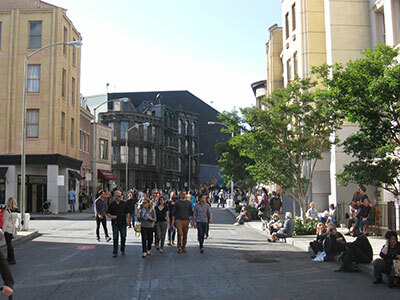 One of the streets at Paramount Studios where Paris Photo L.A. was held. 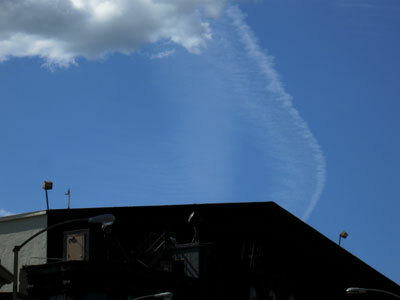 Cloud and Jetstream above Paris Photo L.A.
Gallery exhibition space with white wall. 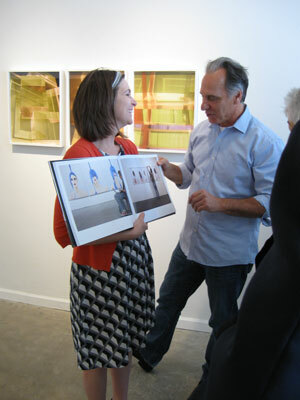 Our VIP Tour Guide, Noelle, discussing an Uta Barth photo with members of INFOCUS. 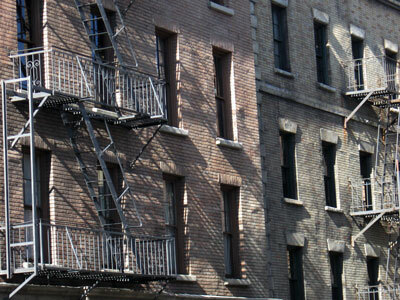 Light along the walls of the back lot buildings. 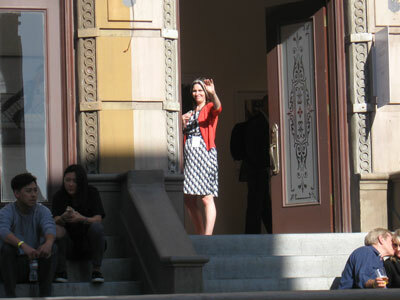 Becky Senf waving from the doorway of one of the gallery spaces. This entry was posted in Exhibits, Prints on May 3, 2014 by Ray.
. . . since my last post and it’s time to catch up. 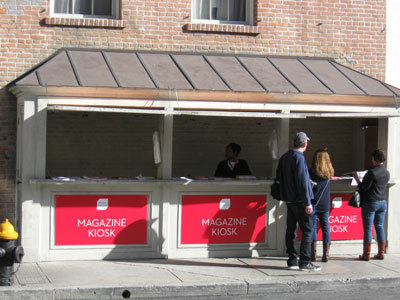 I will be following up shortly with posts on Paris Photo LA and the Palm Springs Photo Festival. This entry was posted in Uncategorized on April 28, 2014 by Ray. 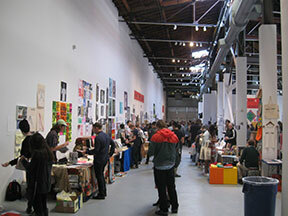 Printed Matter’s LA Art Book Fair was held January 31st to February 2nd at The Geffen Contemporary at MOCA. 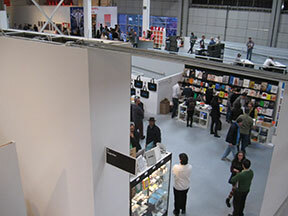 I attended on February 1st and spent five hours perusing the books presented by 250+ vendors. 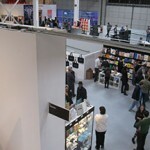 I concentrated my search on photography books only, which cut out at least half of the vendors. At Conveyor Editions I picked up a signed copy of Strange Paradise by Charlie Rubin, which also came with a small paper bag containing two postcards, a sticker and a poem. Conveyor Editions were also showing Visible Spectrum, a set of books by Penelope Umbrico, Hannah Whitaker, Brea Souders, Andrey Bogush, Robert Canali, Inka & Niclas, Dillon DeWaters, and Nicholas Gottlund. At Pau Wau Publications I picked up Muses Volume 3 with work by Francesco Nazardo & Chiara Clarke Siravo, Fryd Frydendahl, Jen Davis, Jim Mangan, and Jordan Sullivan. This is a set of five booklets, each containing eight pages which unfold into a poster, all enclosed in an envelope with a slip sheet. This is one of the more unique handmade books I saw at the fair. I would’ve liked to have seen more books like this. I picked up a signed copy of Todd Hido’s Excerpts From Silver Meadows at the Ampersand Gallery and Fine Books space. The book is a whopping 14″x17″x1″. Heading to the airport the next morning, I wondered if the book would count as my small personal carry on item. Luckily, the flight wasn’t full so I was able to carry it and my bag onto the plane after TSA searched my bag, which is a fairly common occurrence when I travel with cameras. This time, a Holga and six rolls of film, a Canon PowerShot, and a GoPro. On the flight to L.A., the bag made it through okay, but TSA had to swab my hands for residue. I guess they need to do something. 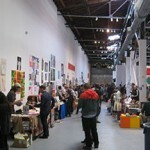 Bought a copy of Printed Web #1 at the Library of the Printed Web table. Printed on newsprint, almost the size of the Hido book, it contains the work of Hito Steyerl, Joachim Schmid, Penelope Umbrico, Christian Bok, Clement Valla, Kenneth Goldsmith, David Horvitz, Chris Alexander, Mishka Henner, &, and Benjamin Shaykin. It’ll be interesting to see what comes in the second edition. And finally, I purchased a copy of Supermarket by Rudy VanderLans from Gallery 16 for less than half price. I like the design and page layout of this book. This entry was posted in Books, Publications on February 5, 2014 by Ray. Available at Fraction Holiday Print Sale. 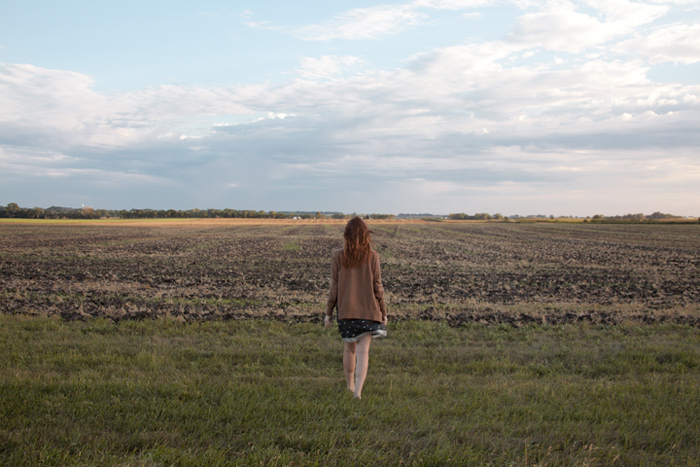 In Sarah Moore’s Self-portrait in My Hometown, we see her from the back, from a short distance, maybe the edge of the road, walking from us through the strip of grass between road and field, the top of her head even with the horizon which bisects the image, overcast sky above, overturned earth below. Her body divides the land into equal parts, each section, in turn, divided in half, mown grass below, plowed field above, current and past and future growth. Left and right side similar. Her clothing echoes the blacks and browns of the rich upturned dirt and stubble, her feet in the present, body and head in the past and future. This entry was posted in Prints on December 2, 2013 by Ray.